The charming, yet rustic town of Cave Creek, Arizona lies in the foothills of Black Mountain, Skull Mesa and Elephant Butte. For over 100 years, Cave Creek has maintained its Wild West character, despite urban sprawl and development of bordering communities. Cave Creek was originally established as a mining community and a stop for the U.S. Calvary in the mid-1870s. Today, the population is just around 5,000 local residents, but Cave Creek has become known for its beautiful desert terrain, world-class resorts, championship golf-course and unique entertainment that can only be found in the Southwest. Keeping with the 1800’s era, you will find local saloons in Cave Creek, such as the popular Harold’s Corral, or the Horny Toad Restaurant and Bar. On any given day, you might find the town of Cave Creek bustling with Wild West vibe that includes live music and fabulous food. After a hot meal and a cold drink, stroll the streets of Cave Creek, where you can take in the local flair from unique shops offering southwestern cloths, furniture and trinkets, to art galleries and museums. The Cave Creek Museum is proud to offer interruptive exhibits that highlight the artifacts of prehistory and the culture of the Cave Creek and Carefree Foothills. The Foothills Library is another hot spot where you can learn more about the history of Cave Creek and the surrounding areas, or take in a class or join a community event. If you really want to get into the Wild West spirit, you could take a trail ride with either Cave Creek Trail Rides or Spur Cross Stables. These are just a few of the outdoor recreations offered in Cave Creek, Arizona. To learn more, click here. Another bit of history lives on in the Tonto Bar and Grill, which is located in the original building from the 1940s that was a part of the Rancho Manana Dude Ranch. Today, its well-known for great food and the championship golf course, Ranch Manana Golf Club. Acclaimed to be “One of the Top 50 Courses in the Country for Women” by Golf Digest and ranked in the “Top 10 Golf Courses in Arizona” by Ranking Arizona, the par-70 layout has amazing views of the Sonoran Desert, local wildlife and the historic charm of the original dude ranch. Rancho Manana is known for its fairness and playability for golfers of any experience. This is a public golf course, click here for tee times and rates. Cave Creek Unified School District 93 is proud to offer before and after school programs and providing quality child nutrition. All menu items are carefully analyzed to meet strict nutritional guidelines and follow compliance with the new Arizona Nutrition Standards mandated by the Arizona Department of Education. 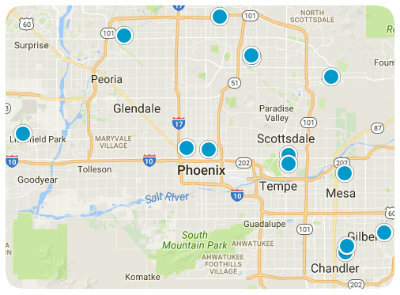 Within the town of Cave Creek, there are several schools that service the area.